"You will feel tired and frustrated, and small things like working out whether a bottle of liquid at the supermarket is soy sauce or fish sauce will start to seem like big problems." Many explanations of culture shock are somewhat lacking in terms of understanding why it happens, so, for those of you who haven’t gone through it before or don’t understand what causes it, here is a good analogy that provides some degree of clarity. When you travel to a new culture, this visible level of culture is the first part you will see and experience. While these aspects of culture are not generally visible or immediately understandable, you can come to understand them and adapt to them if you spend some time within the culture and learn about the shape and structure of it. These parts of culture are very difficult to explain because they are usually unconscious influences on behavior and social structure that are learned through having been brought up within the culture itself. If you ask people to explain them then they would probably have difficulty putting them into words, or would not even know that they existed. It takes a very long time to adapt to these aspects of culture. The deep culture supports the mid-level culture, and the mid-level culture supports the upper culture. When you see things in the upper culture, such as music, then you know that they are connected to aspects of mid-level culture, such as religion and traditions, which are in turn connected to deep culture, such as nuances of expression and subconscious philosophy. "In order to survive on a different iceberg, you need to make assumptions about the parts of the culture that you can’t see." When you live in your own culture you generally understand, consciously or unconsciously, how this all fits together. In other words, you know the shape of your own iceberg. When you visit a new culture, however, you can only see the top bit of the iceberg that sticks out of the water. You know from experience that the rest of it sits under the water, but you cannot immediately see it. 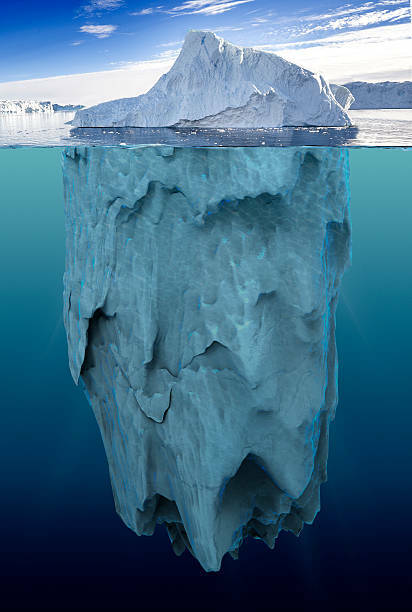 In order to survive on a different iceberg, you need to make assumptions about the parts of the culture that you can’t see. For example, if somebody comes up to you and says something while smiling and then sticks out their hand expectantly, then you would probably have to assume that it was a greeting and that they expected you to shake their hand. In other words, you see the action, and then you make a guess about the connection to the mid-level culture of customs. "Some of the assumptions you make will be right, but some will inevitably be wrong"
The problem, however, is that you only have your model of culture to go by, so while you know that their culture is a different shape and incorporates different connections, you don’t know what it looks like or where the connections are. In order to survive you have to transpose your own mid-level and deep cultural model onto theirs. If you didn’t do this then you would never be able to survive because you have to make assumptions about whether or not the stuff being put in front of you is food or a gift, or whether or not people are greeting you or telling you that you are standing on a snake etc. Some of the assumptions you make will be right, but some will inevitably be wrong. This is where culture shock comes in. It takes a LOT of brain power to keep making these assumptions because you have to think pretty hard each time something comes up to try and work out what it means or what is happening. Initially this is a lot of fun, but after two or three weeks of constant thinking and getting quite a lot of stuff wrong, you will start wanting to be back in an environment where you don’t have to think so hard all the time and where you don’t make so many mistakes. You will feel tired and frustrated, and small things like working out whether a bottle of liquid at the supermarket is soy sauce or fish sauce will start to seem like big problems. You will then stop wanting to integrate, long for familiarity, and probably start trying to force the environment around you to adapt to your culture by telling people, for example, that they shouldn’t force you to eat school lunches because studies in your home country have shown that it’s bad to eat rice in the middle of the day, or that the exercises they do before playing sport are outdated, back home, people know that you should stretch slowly before doing sports rather than bouncing up and down. this is great for de-stressing, releasing frustration and clearing your head. you will get tired very quickly so make sure you get plenty of sleep and also take time out in the weekends and evenings to just relax. make sure you are eating a good, balanced and healthy diet because that will make you feel much better. using paid leave to take a day off when you feel stressed is a great way to relax and refresh. It can be good to use leave on either side of a weekend so you have a few days to get away somewhere. don’t be afraid to do some retail therapy and blow a bit of cash on some stuff, like a bike, stereo or DVD player, that you can use to relax or have fun etc. Even if you are only going to be here for a year, it is really important to make yourself feel at home because your apartment is sometimes the only place where you can get away from everything. Don’t be afraid to spend some money on furnishings and stuff to inject your personality into it and make it feel more like a home. simply find some stuff you enjoy and then do it. You can go to a movie, go skiing/boarding, organize a social event, go out to dinner with some friends, go for a drive, etc. Anything you can enjoy doing without having to think too much is good. don’t hesitate to call one of the PAs, call the JET line, or use any of the many free resources available for help if you just want to talk to somebody and get some of your frustration out. There are a lot of options there and all you need to do to access them is pick up the phone and dial. keeping a diary or simply writing down your thoughts now and then can be a really good way of releasing feelings and frustration. You can do this privately, or you can use a blog or online diary to share thoughts with others. you may feel like a lot is being expected of you and that you are slowly getting overloaded with responsibilities and appointments. You don’t have to be a super hero and sacrifice your well being for the sake of making a good impression though. If something comes up that you feel you are too stressed to take on, then simply explain that you are feeling very stressed and that you’d prefer not to be involved. It is different for everyone, what goals we had in coming to another country. Did you come to Japan for a specific aspect of Japanese culture. To learn the language. To just escape from your own country for a while. Did you have plans to be here for just one year or came with a hope to stay the full five? take these feelings thoughts and goals into account but don`t let them become a cage to hold you. Let them be fluid and adaptable to your situation. Be ready to set new goals and find new passions. One on last note, Always talk to people. You are not alone in these feelings and there are many who will be able to relate to your situation.